Product prices and availability are accurate as of 2019-04-23 10:26:27 UTC and are subject to change. Any price and availability information displayed on http://www.amazon.co.uk/ at the time of purchase will apply to the purchase of this product. 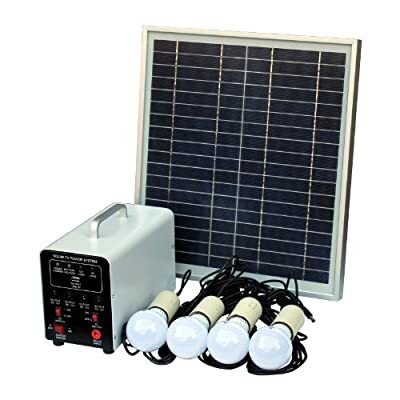 At daytime 15W solar panel charges a 12V battery inside the control system, which then supplies power to 4 x 3W 12V LED lights connected via front sockets on the control system. The control system has a built-in 7Ah battery with an automated solar charge controller to manage the charging procedure and prevent overcharging. The system is very hassle-free to use and set up: the solar panel comes with 10m cable (would fit most items, as longer range is seldom required), and each LED light comes with 5m cable and On/Off switch.